Rizzoli & Isles 7×13 begins as many episodes before it have done – with Jane at Maura’s house or vice versa. While the premise isn’t unusual, the fact that Jane and Maura are about to leave for D.C. and Paris, respectively, gives the opening scene an emotional resonance. Just then, their phones buzz in tandem, and Jane astutely infers, “At least one more.” She and Maura proceed to answer the calls with one more “Rizzoli” “Isles” for the road as the opening credits roll for the final time. The murder of the week composes a very small part of Rizzoli & Isles 7×13. The case is simpler than usual to leave time for the aforementioned party-planning, desk-clearing, etc., so my recap will follow suit. In a nutshell, the victim’s name is Robert, and his cause of death is orthopedic decapitation (also known as “atlanto-occipital dislocation” – thanks, Maura!). Handcuffed to his bed, Robert may have been the victim of a sexcapade gone wrong. Later, Jane spots a similar gift down in Autopsy, but this one’s tortoise-themed. “Unless that’s Bass, you got a suitcase from Ma,” she guesses. Hey, nice reference to the pet we were introduced to in the pilot episode, who now lives at the zoo. Maura encourages Jane to view her gift on a deeper level, pointing out, “The leopard is incredibly intelligent and astoundingly strong. They are elusive, secretive, and beautiful.” Me-ow. Raise your hand if you didn’t think we’d get one last turtle/tortoise misidentification in Rizzoli & Isles 7×13. Gotta love a good throwback. Over in the BRIC, Jane’s confronted by a wall of monitors all featuring the newly Skype-literate Angela laughing triumphantly. “I’m gonna be able to talk to you every day! And see you every day! And you know what? I could watch you teach!” Angela says giddily. Jane makes an A+ face in response before teaching her mom another new trick: pressing F10 to end the call. Back in the squad room, Jane’s frown turns upside-down when she and Korsak place Frankie’s – excuse me, Frank’s – nameplate on Korsak’s old desk, officially passing the mantle. Frank’s so legit now with his adult name and proper desk and chair-spinning-induced dizziness. Two outta three ain’t bad. As the clock strikes eight, marking the end of Jane’s final BPD shift, Jane’s in Maura’s office (of course). “It’s really coming to an end,” Maura says. “We had some good times, though,” Jane responds. Cut to a flashback montage of Jane and Maura making pasta, singing in the car, walking along the edge of the Pacific, play-fighting in yoga class, taking mud baths, clinking beer bottles and wine glasses, and roaring off in the glamorous car Maura rented during their trip to Los Angeles. Back in the present, Jane leaves to get dressed for the party. “I’ll be right behind you,” Maura tells her, then heads off for a final look at Autopsy before turning off the lights. Upstairs, Jane insists that Korsak end his distinguished 32-year career properly. 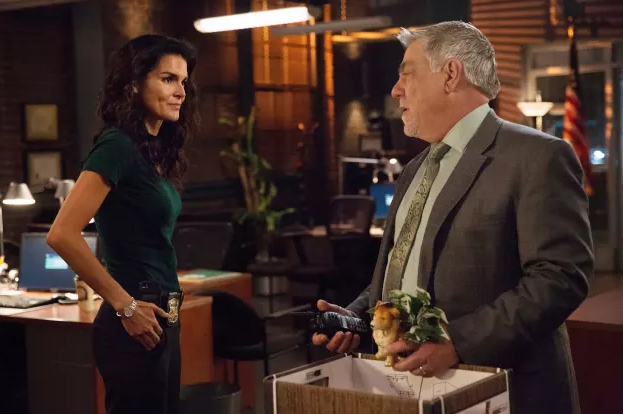 She hands him a walkie, and around the lump in his throat, he manages to say, “Victor 981, Ocean Frank.” In case you’re wondering what “Ocean Frank” means and why it’s the title of Rizzoli & Isles 7×13, it’s the Boston patrol car radio code for “logging off air” – kind of like “over and out.” The voice on the other end of the walkie, responds “Thank you for your service, Sergeant Korsak. Job well done.” Korsak and Jane share an emotional hug which, according to this tweet from Angie Harmon, didn’t require a lot of acting. Kent would’ve been his usual irrelevant self in Rizzoli & Isles 7×13 but for the fact that the writers put him to work collecting video testimonials to screen at the party. In the process, he harasses Jane with a sock puppet and unwittingly captures a private conversation about Frankie and Nina’s engagement that ends up being shown all the party guests – but, hey, at least Frankie and Nina were looking for a way to break the news after Korsak stole their thunder with his retirement announcement last episode. We came up with this idea to …. [use] these goodbye videos as a way for the actors to articulate their feelings, obviously through the characters, but it’s their own feelings about what it’s been like to have done this for so long. In the closing scene of Rizzoli & Isles 7×13, of Rizzoli & Isles season 7, and of Rizzoli & Isles the series, Maura is packing for Paris when Jane drops a bombshell: She’s coming along for the ride. Yup – inspired by Korsak, she dipped into her accrued vacation time and use Maura’s miles to buy a ticket. The key takeaway here is that Jane and Maura are vacationing together in the City of Love, people. Rizzoli & Isles 7×13 ends with Jane and Maura bickering over what Jane packed for the trip, how Maura needs to change the itinerary, and why Jane found it necessary to purchase herself a first-class ticket, because they wouldn’t be Rizzoli and Isles if they didn’t squabble like a married couple. And, hey, under the Parisian sky, at a table on the sidewalk outside a cafe, at the top of the Eiffel Tower, or (knowing Maura) on an underground tour of the city’s famous catacombs, maybe Rizzles will finally happen – for rizzle. Thank you, Nicola, for all the delightful recaps. I was disappointed by the finale, but I expected to feel blah. So I’m taking your prediction to heart: Rizzles in Paris! Thank you, Carol! Rizzles in Paris all the way!